If you are pleased by the thought of winning two scrumptious eggs from Hotel Chocolat, then you are going to be absolutely delighted when I tell you there are actually three luxury prizes to be won. One lucky winner will win two eggs here on Tinned Tomatoes and there is also the chance to win a Kids Easter Bunny Basket over at Little Tums. So which eggs did I choose? Hotel Chocolate have an irresistible collection of Easter Eggs and Easter Gifts to choose from, so it wasn't easy to pick two, but I have to admit it was fun looking through their collection to see what I would like to try. The first egg was the White Cow Beastie Easter Egg. Well I had to, didn't I ? What a fabulous name for an egg. 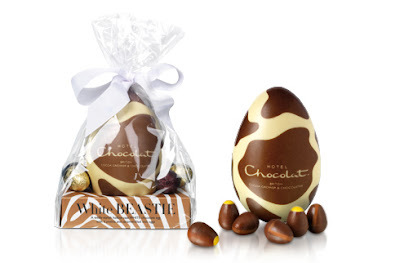 It is a thick white chocolate egg, printed with a cow transfer made of all-natural cocoa butter and accompanied by 6 praline and caramel-filled mini eggs. The white chocolate egg was divine. We all really enjoyed it. Good quality white chocolate, without that sickly sweet flavour of cheaper white chocolate. The praline mini-eggs I couldn't get excited about, but that is more about me. I am not all that keen on praline. I would eat it at a push, but would prefer to share it. 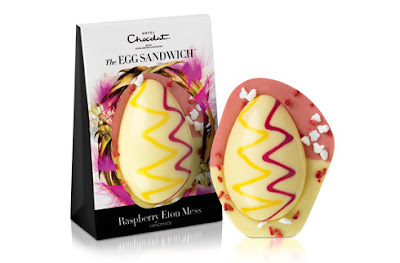 The second egg is the Raspberry Eton Mess Easter Egg Sandwich. Wowee!!!! This is the best Easter Egg I have ever eaten in my whole life! Hotel Chocolat have surpassed themselves with this egg. Irresistible slabs of raspberry and white chocolate, sprinkled with crispy meringue and raspberry pieces, sandwiched between creamy white chocolate egg shells. In my opinion, this is what Hotel Chocolat do best. Flavoured chocolates. Their white, caramel and fruit chocolate are without a doubt the best chocolate I have ever had the pleasure to eat. I just have to have a word with them now and ask them to do a Giant Ostrich Egg in fruit chocolate next year. I also have a small confession to make. I didn't let Graham and Cooper have any of this egg. In fact I may have been rather fierce when I said it was out of bounds. I wasn't a completely horrible wife and mother. Graham did enjoy the beastie egg and pralines and Cooper got this fabulous Kids Easter Basket which he is still enjoying. I don't believe in giving him too much chocolate, so this one is going to last a while. 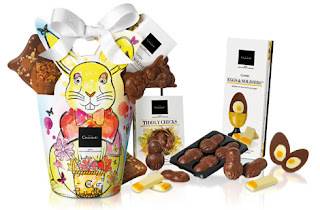 If you would like to be in with a chance of winning two Hotel Chocolat Easter Eggs and an Easter Gift, then all you need to do is leave a comment here and leave a comment over at Little Tums. It's as easy as that. If you don't have a blog, then remember to leave your email address so I can contact you if you win. 1. Follow Tinned Tomatoes on google connect or networked blogs (down the side panel) and leave a comment to say you have done so. 2. Follow me @tinnedtoms on twitter and leave a comment to say you have done so. 3. Follow @HotelChocolat on twitter and leave a comment to say you have done so. 4. Tweet the competition using (Win two luxurious Easter Eggs from @HotelChocolat. One for you & one to share http://www.tinnedtomatoes.com/2012/03/hotel-chocolate-double-giveaway.html #giveaway #win ) and leave a comment to say you have done so. 5. Like the Tinned Tomatoes Facebook Page and leave a comment to say you have done so. 6. Like the Hotel Chocolat Facebook Page and leave a comment to say you have done so. If you leave only one comment you will only get one entry, so remember to write a separate comment for each additional entry. This giveaway runs until midday (UK) on Thursday 5 April 2012 and the winner will be announced the same day. This giveaway is only open to UK residents. Remember to head over to Little Tums for the chance to win more chocolate. Disclosure Statement: I received these eggs free from the Hotel Chocolat to review. I was not required to write a positive review. The opinions I have expressed are my own. Hello! The raspberry eton mess egg does look good, would love to win! And I follow Hotel Chocolat on Twitter! The cow egg looks amazing! I already like Hotel Chocolat's fb page. An Eton Mess easter egg sounds AMAZING!! loving the eaton mess one... I need that!... nice giveaway... here's to ME winning! and now i'm going for a lie down cos i'm exhausted! Oooooo yummy! I want, I want! I would happily eat either of these two eggs! I can never get enough of it!!! I wasn't going to enter this as I shouldn't be eating chocolate, but your description of the white chocolate raspberry sandwich was sooo over the top positive that I couldn't resist! I have tweeted as per instructions! I really want one of the cow eggs for my boyfriend as his last name is Cowe! I keep hearing about Hotel Chocolat! That white chocolate raspberry egg looks divine. Liked Hotel Choc on FB! Following Hotel Choc on FB. I actually prefer the look of that cow egg - yum! I would just love some of that Eton mess! yum! And I have tweeted about your wonderful giveaway! mmmmm lovely chocolate- I really would share wish there was a Hotl Chocolat nearby! Oh my .... Next time you send me a gift, please let it be this egg :) Love you. I'm not eligible, but had to say those Eton Mess eggs looks divine! Hi Jacqui! Just put one of your recipes in the oven. sweet potato bake with chickpeas... looks yum! hope i win!! anna. I had to scroll down a mile to get to the comment box! :D I'd have either egg, they both look delicious, in all honesty I saw the word chocolate and was here in a flash, my fingers work on auto pilot on reading that word. Lovely competition, I love Hotel Chocolat! Forgot to leave my email on the previous post (kimbo_12@msn.com). And i've liked the Tinned Tomatoes facebook page! follow you both on twitter and like hotel chocolat on FB. love your description of the eton mess egg - want to go out and buy one right now! Hi, I would love a delicious Easter surprise! Also I like Hotel Chocolat on facebook :) Thanks!